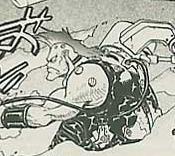 Descartes has a very small part in the manga and never meets Vash, instead he is a prisoner who is told to help stop some of the gung ho guns by the law enforcement. He faces Gray the Ninelives and Midvalley the Hornfreak with the help of some sort of lawmen. Gray crushes Descartes right after the battle is started, and the law men die similar deaths.